The lone star tick, just like most tick types, is mostly found in forested areas with thick underbrush. They largely inhabit the west and southwest parts of Texas but a few scattered groups have spread in other parts like Rhode Island, New Jersey, Prudence Island, Iowa and even some parts of Maine. Smaller groups are suspected to have also spread to nearby areas of the said states where there are hickory and oak woods. The ideal hosts for them include deer, cattle, rodents and birds but they occasionally find their way to dogs and humans. They don’t fly and jump but may be carried by strong gusts of winds, enabling them to become airborne and land on unsuspecting hosts. Direct contact is another means of attaching themselves to hosts and from there, they transport to other areas and hosts, expanding their territory in the process. In the past 20 years, their number has been reported to expand in wider areas other than those mentioned here. 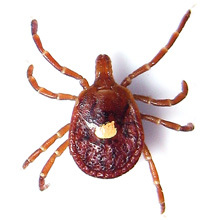 With a scientific name Amblyomma Americanum, this tick is responsible for sicknesses such as Ehrlichiosis, Southern Tick-Associated Rash Illness (STARI) and Tularemia. The body of the adult tick is compounded in a single region with 8 legs – a characteristic that made them belong to the arachnid family. Their color is either brown or tan which can go deeper once engorged with blood. Their distinct mark is the single, silvery white spot on the back for females (thus the name lone star) and the streaks and spots on the body of males. As an adult, the female lone star tick would feed, seemingly ceaselessly, mate then drop to the ground to lay its eggs, thousands of them, in some litter. The male dies after several mating while the female also dies after her eggs are laid. Adult and nymph are highly active from March to May and from July to August and in between is the time for larvae. It takes 3 years for this “3-host ticks” to complete a life cycle and would require one host at a time for each feeding stage. All 3 stages feed on the host animals they could find or on humans. Its mouth is equipped with piercing parts called the chelicerae which are used to make a tiny incision in the skin of their victim. After the incision is made, their barbed teeth are firmly affixed into the skin by its hypostomer and some bodily fluid is secreted into the skin to reinforce the hold. Once firmly attached, the tick would feed and in so doing could inject pathogens that cause the tick-borne diseases mentioned above. The bite of a lone star tick is also suspected to cause red meat allergy. The bite could be painful because of the irritation caused by its saliva. Inflammation, redness and some discomfort may be experienced after. In case bitten, a person must monitor for any signs of infection and must visit a doctor if fever, headache, muscle and joint pains, and swollen lymph nodes are present. Lone star tick bites may be prevented by avoiding the areas where they are known to be there and by using repellents when venturing into bushy or wooded areas. Protection is your best defense and should be practiced by everyone at home. It should also apply to your house pets because they, too, could fall victim.